Friday April 17th 1925 I was home all day. Knit on my bag and wrote some. Ott & Fannie out for evening. I wrote Sciota Lape. Letter from Lydia. Saturday April 18th 1925 I wrote a letter to The Lowes in forenoon. Went to town soon after dinner. Was in Otts office with bank checks. Called on Mrs Bradway and walked home by the north bridge through the old yard. Hattie here in evening. 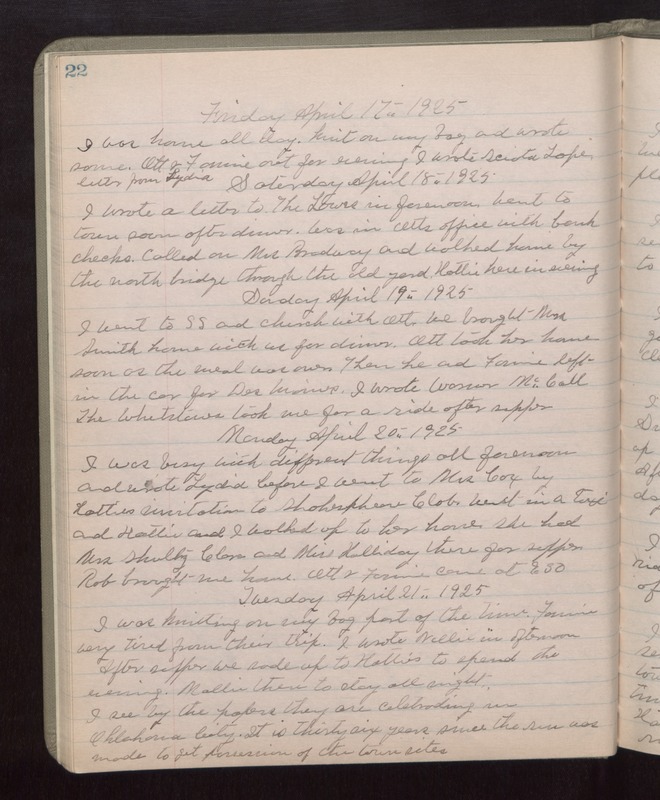 Sunday April 19th 1925 I went to S S and church with Ott. We brought Mrs Smith home with us for dinner. Ott took her home soon as the meal was over. Then he and Fannie left in the car for Des Moines. I wrote Warner McCall. The Whetstones took me for a ride after supper. Monday April 20th 1925 I was busy with different things all forenoon and wrote Lydia before I went to Mrs Cox by Hatties invitation to Shakespeare Club. Went in a taxi and Hattie and I walked up to her house. She had Mrs Shultz, Clara and Miss Halliday there for supper. Rob brought me home. Ott & Fannie came at 9.30. Tuesday April 2st 1925 I was knitting on my bag part of the time. Fannie very tired from their trip. I wrote Nellie in afternoon. After supper we rode up to Hatties to spend the evening. Mollie then to stay all night. I see by the papers they are celebrating in Oklahoma City. It is thirty-six years since the run was made to get possession of the town sites.